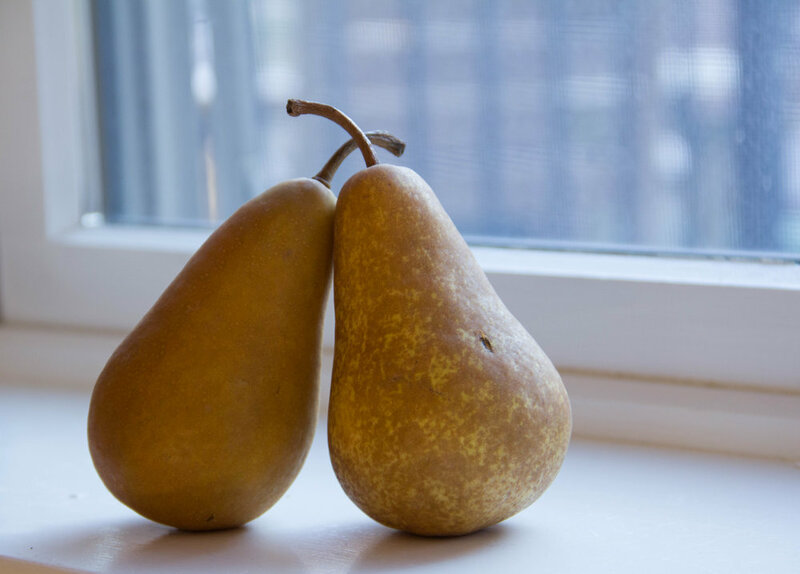 Just two pears, hanging out by the window. Scoop out the pear seeds and create a pocket for the walnuts. Sprinkle with cinnamon! This summer was full of fun travel. More travel means more meals. Why? I don't know! I just think, "What the hey?! I am on vacation! Sure I will have that third dinner today. It's vacation so calories don't count!" You know when else calories don't count? When nobody sees you eating. Like that time you were in the office kitchen and there was three half eaten donuts left, so you shoved them in your mouth before those footsteps coming down the hall manifested into a coworker. He didn't see me eat those, so the calories are a "gimme." Right? That's how that works, right? Or when you were a kid and you knew there was a can of whipped cream in the fridge so you bent over to hide behind the open door and "Frsshhh" (that's the sound of whipped cream pumped straight into the mouth, just FYI). Then you stand up and your mom is right there tapping her foot with one eyebrow raised. "What?" Free calories! Or when your boyfriend is out of town for work and you order enough Thai food for three people. He didn't see you eat it all in one sitting. The delivery man didn't know there are not any more people waiting upstairs to eat. Free. Calories. Drizzle the pears and walnuts with a couple of tablespoons of honey before you put them into the oven. Well all of my vacations are over, so now begins the panic "diet" (I don't really diet, people, I am just more thoughtful about what I eat) and me trying to get back on track before I blow it again during the holidays. Circle of my life. No shame. I just like to live life to the fullest [plate]. The good news is, I have a paleo-friendly, gluten-free dessert for you today! It's probably the easiest thing you will ever make in your life and requires only 4 ingredients. That's right, 4 ingredients. It's in-tune with the Fall flavors and will definitely make your sweet tooth happy! All I did was cut some fresh pears in half, sprinkle on some cinnamon, stuff them with walnuts (or any nut of your choice), and lather them up with honey. Those then get roasted until just soft and super fragrant. Top with some frozen yogurt, protein ice cream, or because these are so low cal, treat yourself to some really decadent salted caramel ice cream like I did! Any way you dress it, these babes are delightful and won't cause any guilt. You can definitely eat these in front of people. Cut pears in half length-wise. Using a spoon, scoop out the seeds and a small pocket for the nuts to fills. Put the pears, cut side up, on a baking dish or in a cast iron (or other oven-safe) pan. Sprinkle each pear half with some of the ground cinnamon, then fill each pear with the chopped nuts. Drizzle the honey all over the pears and nuts. Roast in the preheated oven for 25-30 mins or until slightly golden and soft. Serve as is or with a scoop of ice cream, frozen yogurt, or whipped cream.